Galileo's observations of the moons of Jupiter and the phases of Venus in 1610 led to the wide acceptance of the idea that the Sun is at the center of the solar system as proposed by Nicolaus Copernicus. In the 18th century, when the heliocentric system was firmly established, several scientists, philosophers and mathematicians proposed that the Sun and the planets originated by the gravitational collapse of a nebula of dust and gas. The nebular model has been refined with many modern scientific observations, but it remains the most accepted hypothesis for the formation of the solar system. Chondrites, the most primitive meteorites, provide clues about how the clouds of dust condensed to form the objects that exist today in the solar system. Enstatite chondrites - comprise about 2% of the meteorites falling to Earth. Their most abundant component is a magnesium silicate mineral called enstatite (Mg2Si2O6). It is thought that these chondrites formed within the orbit of Mars. Ordinary chondrites - constitute about 74% of the meteorites falling to Earth. These meteorites are thought to originate from the inner portion of the asteroid belt, between the orbits of Mars and Jupiter. Ordinary chondrites are primarily composed of the minerals olivine, pyroxene, and a small percentage of nickel-iron with various degrees of oxidation. Ordinary chondrites are classified into three groups according to their mineral content. H chondrites (also called olivine-bronzite chondrites) contain a relatively high degree of iron (25 to 31%) both in mineral form and metallic flakes. L chondrites (also called olivine-hypersthene chondrites) contain less total iron (20 to 25%) and less metallic iron than the H group. LL chondrites (also called amphoterites) have very little free iron visible and very little iron in the minerals. LL chondrites contain between 19 to 22% total iron and about 3% in metallic form. Rumuruti chondrites - These rare meteorites have a higher ratio of oxygen-17 isotope (17O) to oxygen-16 (16O) which suggests that they formed further away from the Sun than ordinary chondrites. They are named for the site in Kenya where they were originally found. Carbonaceous chondrites - These meteorites have a high abundance of organic compounds, which indicates that they formed at great distance from the Sun. 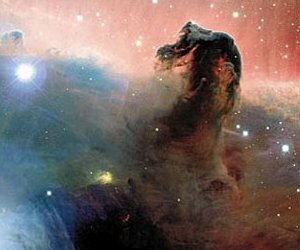 Nebulas, such as the Horsehead Nebula, are sometimes called star nurseries because it is thought that the gravitational collapse of portions of these galactic dust clouds results in the formation of new stars and planets similar to our solar system. Chondrules are tiny mineral beads that are generally smaller than a grain of rice and comprise about eighty percent of the weight of chondritic meteorites. Chondrules are spherical and contain a variety of small mineral crystals. It is thought that chondrules acquired their spherical shape when clumps of stellar dust were heated and partially melted. Some chondrules have a layered structure, indicating that the accretion and flash melting process was repeated multiple times. The time of formation of chondrules ranges from 4567.32 to 4564.71 million years ago. Chondrules made of higher melting point minerals formed earlier than those consisting of lower melting point materials during a brief span of 3 million years. Chondrules viewed by polarized light. Chondrules have been made experimentally in the laboratory by aiming high-energy lasers at various minerals to melt them. Chondrules of different types are created depending on the temperature, cooling rate and chemical composition. Rapid crystallization from a supercooled melt produces spherules with rimmed, excentro-radial, barred and glassy textures similar to those of many meteoritic chondrules. Many theories have been proposed for the formation of chondrules in the solar nebula, and this is a topic with many dissenting opinions. 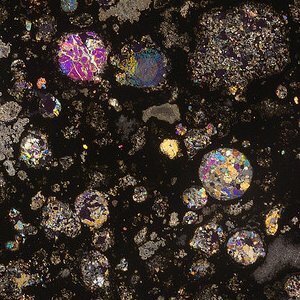 Chondrules have a great diversity of microstructures, and this indicates that there were many ways in which these spherules were created, but they all involved a flash of heat high enough to melt rock, from about 1200°C to 1400°C. The chondrules that have an internal crystalline structure either cooled at a slow rate in order for the mineral crystals to grow, or conversely, crystallized rapidly from a supercooled spherule of molten mineral. The chondrules that have an igneous shell underwent surface melting that did not fuse the interior, so they had to be exposed to a brief period of high temperature. Some chondrules seem to have originated from an initially porous particle that was subsequently melted. 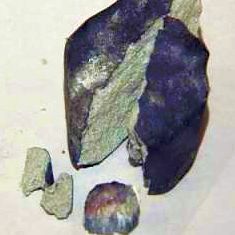 This would happen if small clumps of dust and volatile ices, i.e., minuscule comets, were heated to evaporate the volatile components leaving a porous matrix that would later be compressed; the chondrule would then develop an igneous shell after being heated briefly at a high temperature. 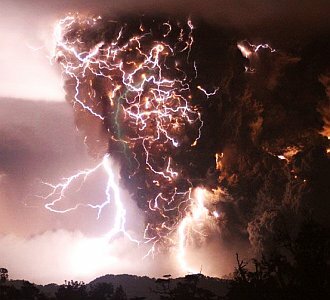 Extensive electrical activity in the ash plume of the Chaitén volcano in Chile. Picture taken May 2, 2008 by Carlos Gutierrez. Nebula lightning - Static electricity builds up in turbulent dust clouds producing lightning in a process similar to what is observed in volcanic ash plumes. Astronauts have found that in a zero-gravity environment, small particles that are charged with static electricity start to clump together. Impacts into meteorite regolith - Meteorites covered in regolith absorb most of the energy of an impact. Local heating can cause melting, and a long flight time of the molten ejecta can allow the interior of the spherules to develop crystals. Products of hot inner nebula - A protoplanetary dust cloud with a hot center would provide the conditions for accretion and heating of particles. The repeated circulation of particles through hot and cold regions would lead to multi-layered structures similar to those of hailstones. Flash heating event - Solar flares could provide flash heating of nebular dust for the formation of chondrules. Meteor ablation products - Chondrules could be produced by removal of material from the surface of meteors by vaporization, chipping, or other erosive processes. Accretion shocks - Compression waves traveling through a dense dust cloud could have enough energy to fuse particles. The chondrules within chondritic meteorites tell the story of the formation of the Solar system. The conditions were complex and varied depending on the distance of the chondrules from the evolving Sun and protoplanets. Much more data is needed before scientists can reach a consensus about the conditions that formed these primordial condensation products of our solar nebula. Alan E. Rubin, Secrets of Primitive Meteorites, Scientific American, February 2013, p.37-41.